Make Customers VIPs with CPQ. ETA? ASAP. So, What Does CPQ Actually Do? Describe the role of Salesforce CPQ in the sales cycle. Identify inefficiencies common to legacy sales processes. Explain how Salesforce CPQ addresses sales team pain points. You and the rest of your sales team at Infinity Solutions want to close deals, fast. That is a fact. It’s one of the reasons you use Salesforce. It’s also a good reason to spend some time in this module, where you’ll learn about Salesforce CPQ, a native Salesforce app that helps you and your team close deals even faster. CPQ stands for configure, price, and quote. To remember that, think of these questions: What products does the customer want to buy (configure)? How much do those products cost (price)? How can we give the customer details about the sale (quote)? You ask and answer these questions every day. Salesforce CPQ makes the process much easier for you and your team. And it helps you produce a quality quote that’s complete and accurate and that looks professional. Well maybe not sticky notes, but there’s been a lot of manual updating going on. Bottom line: You know you need a new solution because your current system isn’t working. You and the other Infinity Solutions sales reps assemble quotes by hand and hope you have the right products and prices. Your customers wait for a quote that may not be accurate when it finally arrives. Infinity Solutions sales operations staff are always reminding you to update the opportunity and related systems, or fix the data when it’s wrong. At the end of the day, with enough effort, you do close your deals. Eventually. Hopefully. You’ve thought about building a homegrown solution to help the process move a little faster, but you know that these solutions are often difficult to maintain. At your last job, only one person knew how to maintain the tool, and that person single-handedly kept the ship afloat. You also know that if Infinity Solutions builds its own CPQ tools, you’ll be lucky if the tools play nicely with Salesforce and other systems and give you complete integration. If you’re not lucky, your team will have to hire someone to manually transfer data across all your systems. Finally, just because Infinity Solutions has an established sales process doesn’t mean that all your sales reps follow that process. Some on your team need help to follow the rules, and rule enforcement takes time. You know you have better ways to spend that time. The C is for configure. You pick out what they’ll buy. The P is for price. We add it up, easy as pie. The Q is for quote: A nice PDF for you. And that’s what you get with Salesforce CPQ. Now let’s spell it out in detail. You start by answering a few simple questions about your customer and what they’re looking for. For example, is your customer a commercial, government, or academic institution? Based on your answer to this and other questions specific to your sales process at Infinity Solutions, you see a tailored list of products. Salesforce CPQ uses smart rules to make sure you and your reps sell related products together  and to prevent incompatible products from ending up on the same quote. You have to find the right price for the products you’re selling, and Salesforce CPQ serves as the pricing source of truth. You and your reps can apply discretionary discounts  while Salesforce CPQ handles the rest, including the math . Yes, Salesforce CPQ does all the math, automatically. You focus on your customers, not your calculator. 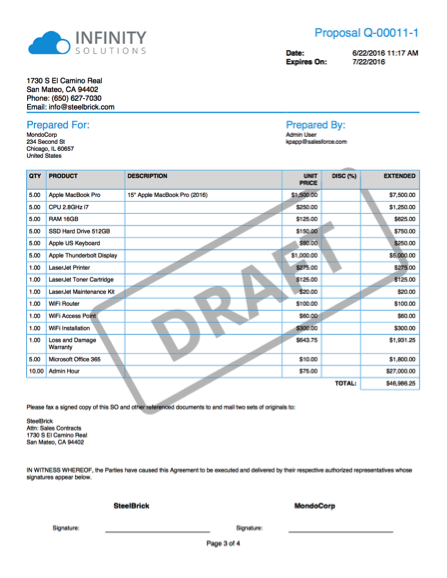 In no time, you’re ready to generate a PDF with all quote details and send it to your customer with just one click. Because you can customize the look of your company’s quotes, they appear professional, and when the whole team uses Salesforce CPQ, every quote looks consistent with the rest. The quote is dynamic too, so if your quote requires special terms, they appear automatically. Add e-signature integration, and you’ll be closing deals faster than ever.